We’ve had a steep learning curve as new dog owners. Our crooked-tailed mischief-maker has loads of energy and even with hour-long romps in the park by the lake and numerous shorter walks around the neighborhood she still manages to race around our apartment at a frenetic pace. She also has a thing for chewing shoes, boots, slippers. And for hats and gloves and sunglasses and books. And for the TV remote, which I’m pretty sure, as of this morning, has to be replaced. We’re still working on the housetraining. And on not eating junk on the sidewalk or in the park. That last one is probably the thing that led to her overnight hospital stay. Oh, Inka. Inky dink. Dinky doodle. You wear me out, girl. To be honest, she’s taken up so much of my time and energy lately that I haven’t had much left for cooking. It’s been a steady stream of GrubHub and sometimes sneaking away to restaurants for an hour or two of peace lately. If a young dog can run me this ragged, I don’t know how new parents do it. But. Something had a strong enough pull to lure me, exhausted as I was, into the kitchen. 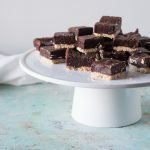 I had read about some brownies a few weeks ago on Luisa’s site. And then I saw them again on The Kitchn. And again on Lecia’s site. 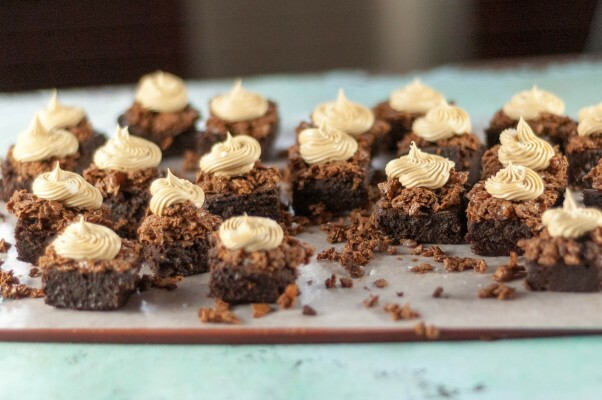 Bittersweet brownies with salted peanut butter frosting from Ashley Rodriguez’s new book Date Night In: More than 120 Recipes to Nourish Your Relationship, which is about how two parents of young kids have figured out how to find romance in their own kitchen. I love Ashley’s site and I can’t wait to get my hands on a copy of her book. It was like these brownies were following me around. I couldn’t get them out of my mind. I’ve never been one for brownies with frosting, but usually I see brownies slicked with chocolate frosting, which never manages to be as chocolatey as the brownies themselves, and somehow diminishes the whole thing for me. But salted peanut butter buttercream? That’s a whole different story. I also couldn’t leave well enough alone. I like rich fudgy brownies, but ever since making brownies with a shortbread crust, I’ve discovered I like them even better with some textural contrast. Something pleasantly crispy and crunchy. With these, I couldn’t resist the urge to add a crispy chocolate peanut butter feuilletine layer. Feuilletine flakes are delicate, buttery, flaky sweet crispy wafer cookie bits that pastry chefs use all the time to add contrasting texture to otherwise smooth or soft desserts. You can make your own, or you can do what I do and buy it already made. I coated the feuilletine flakes with a mixture of chocolate and peanut butter praline and patted the layer over the baked and cooled brownies. 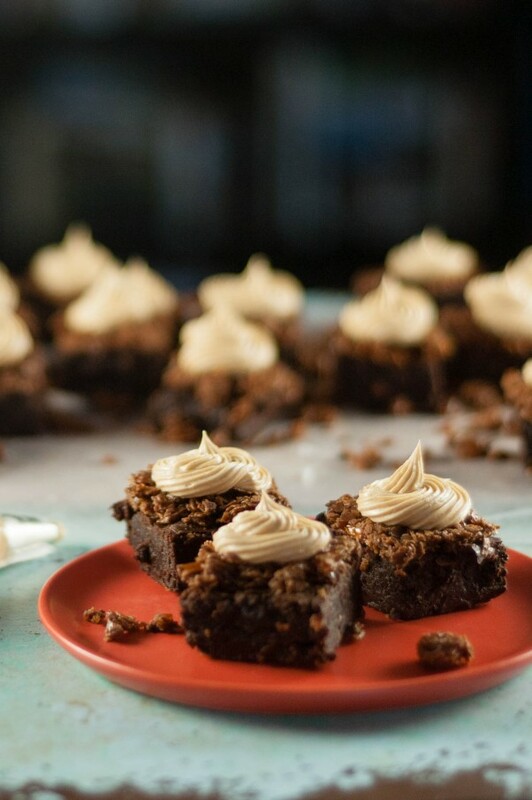 With the dense, fudgy brownies, delicate crispy chocolate-peanut-butter-feuilletine, and light and creamy peanut butter buttercream, these salty peanut butter crunch brownies hit my favorite textural balance. The bits of sea salt sprinkled over the peanut butter buttercream gives them a salty edge I just love. These brownies are rich and fudgy and intensely chocolatey from a combination of unsweetened chocolate and cocoa powder. 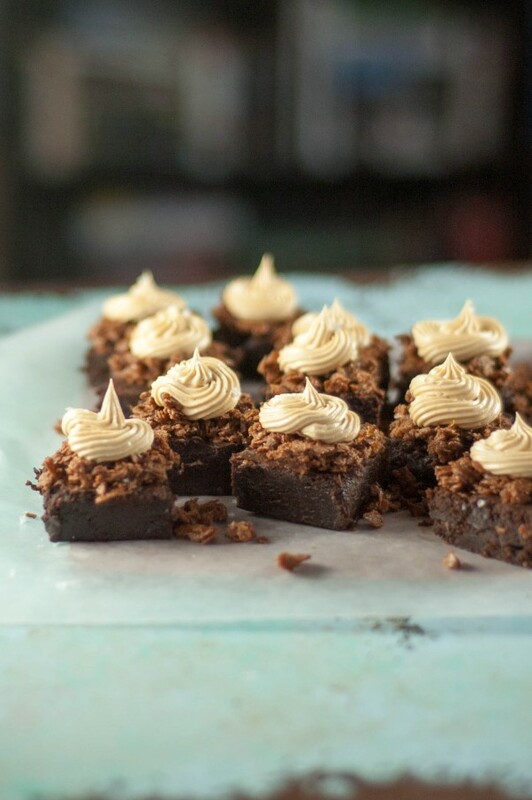 Their flavor is rounded out with brown butter, which it turns out is great in a brownie. 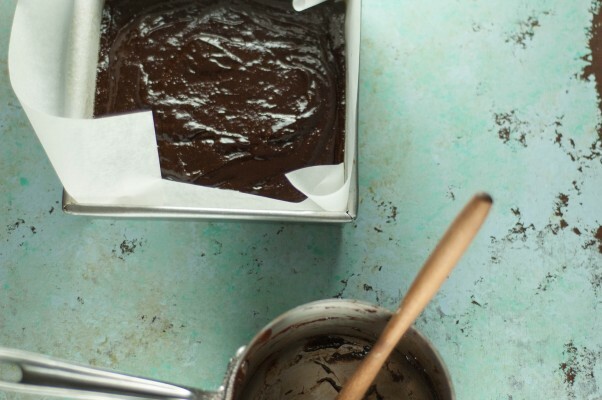 You could eat just the brownies on their own if you like. But I think it’s worth it to try the toppings here. While feuilletine is a little bit of a pain to track down, the internet has made it much easier. I buy mine here. You can also make your own (even a gluten-free version) if you’re feeling ambitious. I’m not a big frosting person in general, but this salted peanut butter buttercream is like the best smooth and creamy peanut butter filling I could imagine. I used Skippy, but you can use any smooth peanut butter you like. 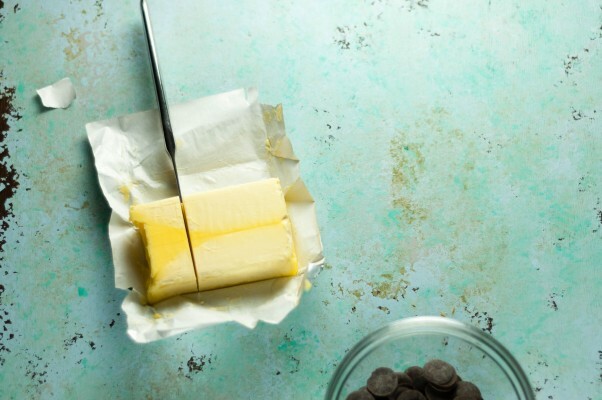 The buttercream gets topped with flaky sea salt. While you could get away with kosher salt in a pinch, I think it’s worth seeking out something with big flakes like Maldon for this. Preheat oven to 325°F. Line an 8x8-inch square baking pan with parchment paper, leaving enough to overhang on two sides. In a medium, heavy bottomed saucepan, melt the butter over medium-high heat. Allow it to cook until it bubbles up and the solids in the bottom of the pan turn medium brown and smell nutty and fragrant. 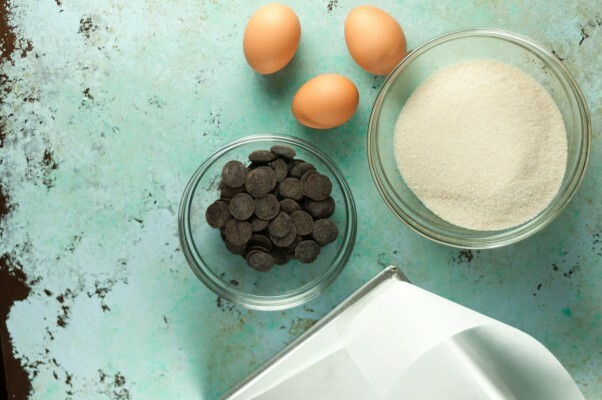 Remove from heat, and add the unsweetened chocolate. Stir until the chocolate has melted completely. Add the sugar and vanilla extract and stir to combine. Then add the eggs, one at a time, and mix until incorporated. Stir in the salt. Sift the flour and cocoa powder into the saucepan and stir until thoroughly incorporated. Pour the batter into the prepared pan and bake until a toothpick inserted into the center comes out clean, about 30-35 minutes. Make the chocolate peanut butter crunch. 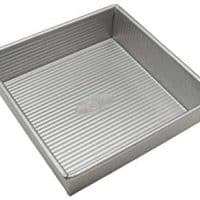 Line a sheet pan with a silpat mat. In a small saucepan over medium-high heat, heat the sugar until it turns golden brown and is completely melted and liquid. Pour onto the silpat mat and let cool until hardened, about 10 minutes. 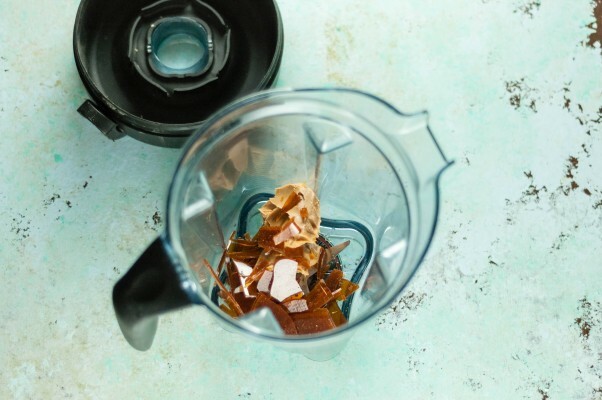 Break up the caramelized sugar into pieces and blend with the peanut butter in a food processor or blender until the visible sugar pieces are small and well incorporated into the peanut butter. 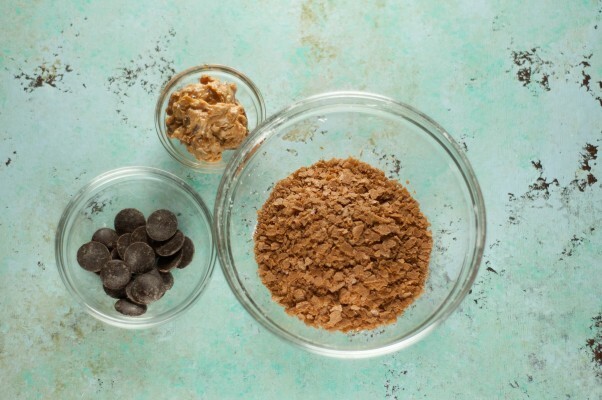 In the microwave or in a heat-safe bowl set over a pan of simmering water, melt the dark chocolate. 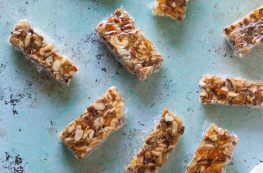 In the microwave or in a saucepan on the stove, warm the peanut butter praline mixture until it feels just warm to the touch. 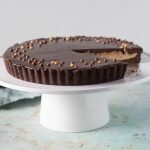 In a medium mixing bowl, combine the melted chocolate and warmed peanut butter praline. Add the feuilletine flakes and stir gently until thoroughly coated. Pat the mixture in an even layer over the brownies, and let it firm up. About 20-30 minutes. Remove from the pan by pulling on the sides of the parchment paper. 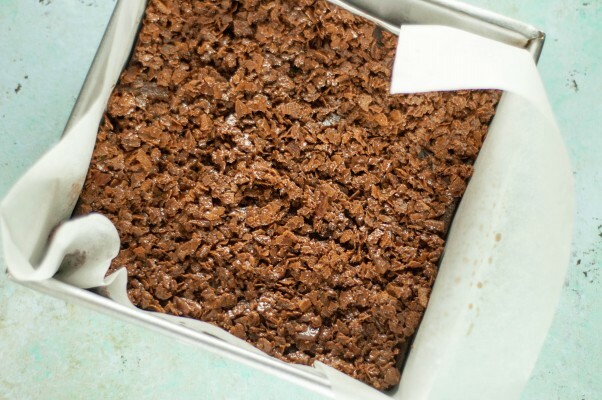 Slice the brownies into 16-25 pieces, depending on how big you like your brownies. 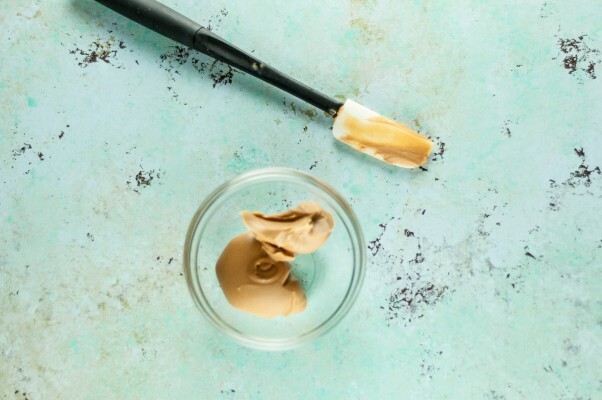 Don’t worry if some of the crunch layer falls off–just gently pat it back on to any bare spots. 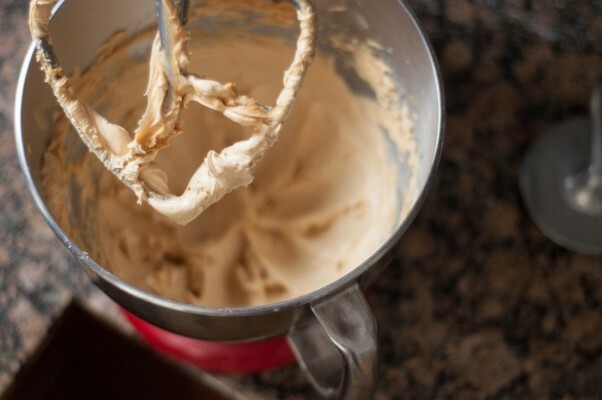 In the bowl of a stand mixer, combine the butter, peanut butter, confectioners’ sugar and vanilla extract and whip until the mixture has lightened in color and everything is well combined. Add to a pastry bag fitted with a large star tip and pipe rosettes on each brownie. Sprinkle with sea salt. Serve.